At the Springfield YMCA, Naismith struggled with a rowdy class that was confined to indoor games throughout the harsh New England winter, thus was perpetually short-tempered. Under orders from Dr. Luther Gulick, head of physical education there, Naismith was given 14 days to create an indoor game that would provide an "athletic distraction"; Gulick demanded that it would not take up much room, could help its track athletes to keep in shape and explicitly emphasized to "make it fair for all players and not too rough." In his attempt to think up a new game, Naismith was guided by three main thoughts. Firstly, he analyzed the most popular games of those times (rugby, lacrosse, soccer, football, hockey, and baseball); Naismith noticed the hazards of a ball and concluded that the big, soft soccer ball was safest. Secondly, he saw that most physical contact occurred while running with the ball, dribbling or hitting it, so he decided that passing was the only legal option. Finally, Naismith further reduced body contact by making the goal unguardable, namely placing it high above the player's heads. To score goals, he forced the players to throw a soft, lobbing shot that had proven effective in his old favorite game duck on a rock. Naismith christened this new game "Basket Ball" and put his thoughts together in 13 basic rules. The first game of "Basket Ball" was played in December 1891. In a handwritten report, Naismith described the circumstances of the inaugural match; in contrast to modern basketball, the players played nine versus nine, handled a soccer ball, not a basketball, and instead of shooting at two hoops, the goals were a pair of peach baskets: "When Mr. Stubbins brot [sic] up the peach baskets to the gym I secured them on the inside of the railing of the gallery. This was about 10 feet from the floor, one at each end of the gymnasium. I then put the 13 rules on the bulletin board just behind the instructor's platform, secured a soccer ball, and awaited the arrival of the class ... The class did not show much enthusiasm, but followed my lead ... I then explained what they had to do to make goals, tossed the ball up between the two center men and tried to keep them somewhat near the rules. Most of the fouls were called for running with the ball, though tackling the man with the ball was not uncommon." In contrast to modern basketball, the original rules did not include what is known today as the dribble. Since the ball could only be moved up the court by a pass early players tossed the ball over their heads as they ran up court. Also following each "goal", a jump ball was taken in the middle of the court. Both practices are obsolete in the rules of modern basketball. I showed them two peach baskets I'd nailed up at each end of the gym, and I told them the idea was to throw the ball into the opposing team's peach basket. I blew a whistle, and the first game of basketball began. ... The boys began tackling, kicking, and punching in the clinches. They ended up in a free-for-all in the middle of the gym floor. [The injury toll: several black eyes, one separated shoulder, and one player knocked unconscious.] "It certainly was murder." [Naismith changed some of the rules as part of his quest to develop a clean sport.] The most important one was that there should be no running with the ball. That stopped tackling and slugging. We tried out the game with those [new] rules (fouls), and we didn't have one casualty. By 1892, basketball had grown so popular on campus that Dennis Horkenbach (editor-in-chief of The Triangle, the Springfield college newspaper) featured it in an article called "A New Game", and there were calls to call this new game "Naismith Ball", but Naismith refused. 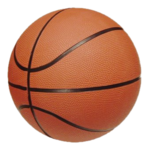 By 1893, basketball was introduced internationally by the YMCA movement. From Springfield, Naismith went to Denver, where he acquired a medical degree, and in 1898, he joined the University of Kansas faculty at Lawrence. The University of Kansas men's basketball program officially began following Naismith's arrival in 1898, which was six years after Naismith drafted the sport's first official rules. Naismith was not initially hired to coach basketball, but rather as a chapel director and physical-education instructor. In those early days, the majority of the basketball games were played against nearby YMCA teams, with YMCAs across the nation having played an integral part in the birth of basketball. Other common opponents were Haskell Indian Nations University and William Jewell College. Under Naismith, the team played only one current Big 12 school: Kansas State (once). Naismith was, ironically, the only coach in the program's history to have a losing record (55–60). However, Naismith coached Forrest "Phog" Allen, his eventual successor at Kansas, who went on to join his mentor in the Naismith Memorial Basketball Hall of Fame. When Allen became a coach himself and told him that he was going to coach basketball at Baker University in 1904, Naismith discouraged him: "You can't coach basketball; you just play it." Instead, Allen embarked on a coaching career that would lead him to be known as "the Father of Basketball Coaching." During his time at Kansas, Allen coached Dean Smith (1952 National Championship team) and Adolph Rupp (1922 Helms Foundation National Championship team). Smith and Rupp have joined Naismith and Allen as members of the Basketball Hall of Fame. By the turn of the century, enough college teams were in the East that the first intercollegiate competitions could be played out. Although the sport continued to grow, Naismith long regarded the game as a curiosity and preferred gymnastics and wrestling as better forms of physical activity. However, basketball became a demonstration sport at the 1904 Summer Olympics in St. Louis. As the Naismith Memorial Basketball Hall of Fame reports, Naismith was also neither interested in self-promotion nor in the glory of competitive sports. Instead, he was more interested in his physical-education career; he received an honorary PE masters degree in 1910, patrolled the Mexican border for four months in 1916, traveled to France, and published two books (A Modern College in 1911 and Essence of a Healthy Life in 1918). He took American citizenship in 1925. In 1909, Naismith's duties at Kansas were redefined as a professorship; he served as the de facto athletic director at Kansas for much of the early 20th century. Naismith had “strong feelings against segregation”, dating to his World War I-era service in France and on the United States-Mexico border, and he strove for progress through modest steps. During the 1930s, he would not or could not get African-Americans onto Kansas’ varsity Jayhawks, but he did help to engineer the admission of black students to the university’s swimming pool. Up to then, they had been given automatic passing grades on a required swimming test without entering the pool, so it could remain all-white. In 1923, Dr. Naismith was a founder of the Sigma Phi Epsilon fraternity at the University of Kansas. Naismith was deeply involved with the members, serving as chapter counselor for 16 years, from 1923 until his death in 1939. He eventually married SigEp's housemother, Mrs. Florence Kincaid. Members interviewed from that era remembered Dr. Naismith: "He was deeply religious", "He listened more than he spoke", "He thought sports were nothing but an avenue to keep young people involved so they could do their studies and relate to their community", and "It was real nice having someone the caliber of Dr. Naismith so involved ... he helped many a SigEp!" In 1935, the National Association of Basketball Coaches (created by Naismith's pupil Phog Allen) collected money so that the 74-year-old Naismith could witness the introduction of basketball into the official Olympic sports program of the 1936 Summer Olympic Games. There, Naismith handed out the medals to three North American teams: United States, for the gold medal, Canada, for the silver medal, and Mexico, for their bronze medal. During the Olympics, he was named the honorary president of the International Basketball Federation. When Naismith returned, he commented that seeing the game played by many nations was the greatest compensation he could have received for his invention. In 1937, Naismith played a role in the formation of the National Association of Intercollegiate Basketball, which later became the National Association of Intercollegiate Athletics (NAIA). Naismith became professor emeritus in Kansas when he retired in 1937 at the age of 76. Including his years as coach, Naismith served as athletic director and faculty at the school for a total of almost 40 years. Naismith died in 1939 after he suffered a fatal brain hemorrhage. He was interred at Memorial Park Cemetery in Lawrence, Kansas. His masterwork "Basketball — its Origins and Development" was published posthumously in 1941. In Lawrence, Kansas, James Naismith has a road named in his honor, Naismith Drive, which runs in front of Allen Fieldhouse and James Naismith Court therein are named in his honor, despite Naismith having the worst record in school history. Naismith Hall, a college residential dormitory, is located on the northeastern edge of 19th Street and Naismith Drive. Naismith invented the game of basketball and wrote the original 13 rules of this sport, as opposed to the NBA rule book which features 66 pages. The Naismith Memorial Basketball Hall of Fame in Springfield, Massachusetts, is named in his honor, and he was an inaugural inductee in 1959. The National Collegiate Athletic Association rewards its best players and coaches annually with the Naismith Awards, among them the Naismith College Player of the Year, the Naismith College Coach of the Year, and the Naismith Prep Player of the Year. After the Olympic introduction to men's basketball in 1936, women's basketball became an Olympic event in Montreal during the 1976 Summer Olympics. Naismith was also inducted into the Canadian Basketball Hall of Fame, the Canadian Olympic Hall of Fame, the Canadian Sports Hall of Fame, the Ontario Sports Hall of Fame, the Ottawa Sports Hall of Fame, the McGill University Sports Hall of Fame, the Kansas State Sports Hall of Fame, FIBA Hall of Fame, and the Naismith Memorial Basketball Hall of Fame, which was named in his honor. The FIBA Basketball World Cup trophy is named the "James Naismith Trophy" in his honour. On June 21, 2013, Dr. Naismith was inducted into the Kansas Hall of Fame during ceremonies in Topeka. Naismith's home town of Almonte, Ontario, hosts an annual 3-on-3 tournament for all ages and skill levels in his honor. Every year, this event attracts hundreds of participants and involves over 20 half-court games along the main street of the town. All proceeds of the event go to youth basketball programs in the area. The original rules of basketball written by James Naismith in 1891, considered to be basketball's founding document, was auctioned at Sotheby's, New York, in December, 2010. Josh Swade, a University of Kansas alumnus and basketball enthusiast, went on a crusade in 2010 to persuade moneyed alumni to considering bidding on and hopefully winning the document at auction to give it to the University of Kansas. Swade eventually persuaded David G. Booth, a billionaire investment banker and KU alumnus, and his wife Suzanne Booth, to commit to bidding at the auction. The Booths won the bidding and purchased the document for a record US$4,338,500, the most ever paid for a sports memorabilia item, and gave the document to the University of Kansas. Swade's project and eventual success are chronicled in a 2012 ESPN 30 for 30 documentary "There's No Place Like Home" and in a corresponding book, The Holy Grail of Hoops: One Fan's Quest to Buy the Original Rules of Basketball. The University of Kansas constructed an $18 million building named the Debruce Center, which houses the rules and opened in March 2016. James Naismith was the second child of Margaret and John Naismith, two Scottish immigrants. His mother, Margaret Young, was born in 1833 and immigrated to Lanark County, Canada in 1852 as the fourth of 11 children. His father, John Naismith, was born in 1833, left Europe when he was 18, and also settled down in Lanark County. On June 20, 1894, Naismith married Maude Evelyn Sherman (1870–1937) in Springfield, Massachusettes, USA. The couple had five children: Margaret Mason (Stanley) (1895–1976), Helen Carolyn (Dodd) (1897–1980), John Edwin (1900–1986), Maude Ann (Dawe) (1904–1972), and James Sherman (1913–1980). He was a member of the Pi Gamma Mu and Sigma Phi Epsilon fraternities. Naismith was a Presbyterian minister, and was also remembered as a Freemason. Maude Naismith died in 1937, and on June 11, 1939, he married his second wife, Florence B. Kincaid. On November 19 of that year, Naismith suffered a major brain hemorrhage and died 9 days later in his home in Lawrence. He was 78 years old. Coincidentally, Naismith died 8 months after the birth of the NCAA Basketball Championship, which today has evolved to one of the biggest sports events in North America. Naismith is buried with his first wife in Memorial Park Cemetery in Lawrence. Florence Kincaid died in 1977 at the age of 98 and is buried with her first husband, Dr. Frank B. Kincaid, in Elmwood Cemetery in Beloit, Kansas. ^ Michael Beschloss (2014-05-02). "Naismith's Choices on Race, From Basketball's Beginnings". nytimes.com. Retrieved 2018-12-29. ^ Kerkhoff, Blair. "The NAIA basketball tournament? Throw 32 teams in the same building and see which is the last one standing at the end of a weeklong frenzy". Retrieved 2008-09-30. The 1898–99 Kansas Jayhawks men's basketball team represented the University of Kansas in its first season of collegiate basketball. The head coach was Dr. James Naismith, the inventor of the game, who served his 1st year. The 1899–1900 Kansas Jayhawks men's basketball team represented the University of Kansas in its second season of collegiate basketball. The head coach was Dr. James Naismith, the inventor of the game, who served his second year. The 1901-1902 Kansas Jayhawks men's basketball team represented the University of Kansas in its fourth season of collegiate basketball. The head coach was Dr. James Naismith, who served his 4th year in that capacity. The 1902-1903 Kansas Jayhawks men's basketball team represented the University of Kansas in its fifth season of collegiate basketball. The head coach was Dr. James Naismith, the inventor of the game, who served his 5th year in that capacity. The 1903-1904 Kansas Jayhawks men's basketball team represented the University of Kansas in its sixth season of collegiate basketball. The head coach was Dr. James Naismith, the inventor of the game, who served his 6th year. The 1905-1906 Kansas Jayhawks men's basketball team represented the University of Kansas in its eighth season of collegiate basketball. The head coach was Dr. James Naismith, the inventor of the game, who served his 8th year in that capacity. The 1906-1907 Kansas Jayhawks men's basketball team represented the University of Kansas in its ninth season of collegiate basketball. The head coach was Dr. James Naismith, the inventor of the game, who served his 9th and final year in that capacity. Allen Rae (December 26, 1932 – August 20, 2016) was a Canadian basketball referee. He refereed in the 1964 Olympics, 1968 Olympics, 1972 Olympics (including a semi-final game in each of those) and 1976 Olympics. He also refereed the final of the 1975 European Championship. He was the Technical Commissioner in 1984 Olympics, 1988 Olympics, 1992 Olympics, 1990 World Championship and 1983 Pan American Games. From 1984 to 1994, he served as Vice President of the Technical Commission of the FIBA. He also served as the President of the Dr. James Naismith Basketball Foundation & Museum since 2003. In 1997 Rae was awarded FIBA Order of Merit, and in 2007 he was enshrined in the FIBA Hall of Fame (also inducted to Canada Basketball Hall of Fame in 2000). Butrimonys (Polish: Butrymańce) is a small town in Alytus County in southern Lithuania. In 2011 it had a population of 941. Its most famous son was Bernard Berenson (1865-1959), a famous and still influential American art historian. Senda Berenson, known as the Mother of Women's Basketball, was born here March 19, 1868. Berenson introduced basketball to women in 1892 at Smith College in Northampton, Massachusetts, United States, a year after being first invented by James Naismith. She also authored the first Basketball Guide for Women (1901–07). George T. Hepbron (August 27, 1863 in Still Pond, Maryland, US – April 30, 1946 in Newark, New Jersey) was a basketball referee. He is credited with writing the game's first book, How to Play Basketball, in 1904.Hepbron was a close friend of Dr. James Naismith, and subsequently played a major role in the early development of the game, especially in the area of rules. Hepbron held leadership roles with the Amateur Athletic Union Basketball Committee (1896) and the National Basketball Rules Committee (1915–1933).Hepbron was enshrined in the Naismith Memorial Basketball Hall of Fame in 1960 as a referee. James Henderson Naismith (born 26 July 1968) is Professor of Structural Biology at the University of Oxford, Director of the Research Complex at Harwell and co-interim academic lead of the Rosalind Franklin Institute. Until May 2017 he was Bishop Wardlaw Professor of Chemical Biology at the University of St Andrews. The National Association of Intercollegiate Athletics Men's Basketball National Championship has been held annually since 1937 (with the exception of 1944). The tournament was established by James Naismith to crown a national champion for smaller colleges and universities. The NAIA Tournament features thirty-two teams, and the entire tournament is contested at one location in one week, rather than multiple locations over a series of weekends. Since 1992, the NAIA has sponsored a Division II championship and will continue to do so until 2020. The Division I tournament is played in Kansas City, Missouri, while the Division II tournament is held at the Sanford Pentagon in Sioux Falls, South Dakota. Naismith Award is a basketball award named after Dr. James Naismith, and awarded by the Atlanta Tipoff Club. The Naismith Trophy is a trophy awarded to the men's champion of the FIBA Basketball World Cup, and is named in honor of basketball's inventor, James Naismith. The trophy was first awarded to the winner of the 1967 FIBA World Championship. The current version of the trophy will be awarded for the first time at the 2019 FIBA Basketball World Cup. The First Team were the first players known to have played the sport of basketball, having been taught the game in 1891 by James Naismith, who is recognized as the inventor of the sport. The team comprised 18 players who were studying in Springfield, Massachusetts, to become executive secretaries of the YMCA and who, as part of their coursework, studied physical education with Naismith, who is said to have invented the game to teach teamwork skills to his charges. The team was inducted as a group into the Naismith Memorial Basketball Hall of Fame as part of that organization's inaugural 1959 induction class for their efforts in popularizing the sport and as the game's first practitioners. WMAS-FM (94.7 MHz) is a commercial radio station licensed to Enfield, Connecticut. It is currently owned by Cumulus Media and airs an adult contemporary radio format. Entercom operates the station under a local marketing agreement, and is in the process of acquiring it outright. While WMAS-FM primarily serves the Pioneer Valley of Western Massachusetts, it is also heard in Northern and Central Connecticut. WMAS-FM's studios and offices are in The James Naismith Memorial Basketball Hall of Fame, a major attraction in Springfield, a city credited as the birthplace of the game of basketball. Visitors to the Hall of Fame can watch the hosts of both the AM and FM stations, from studios in the northern entrance hall. The transmitter is also located in Springfield, along U.S. Route 20, near the Connecticut River. While its effective radiated power (ERP) is 50,000 watts, the maximum power for non-grandfathered FM radio stations in Massachusetts, WMAS-FM's tower is only 180 feet (55 meters) in height above average terrain (HAAT). Its signal is somewhat limited because co-owned WNSH in Newark, New Jersey, also broadcasts on 94.7 MHz.